Inline Homogenizer In Inline agitation system, the possibility of materials - Liquid or Solid passing through it, without subjected to intense hydraulic and mechanical shear actions is zero. Here suction pipe (inlet pipe) is centrally mounted & outlet is radially mounted , therefore it is physically impossible for any material to pass from inlet to outlet without exposed to agitation. The machine is versatile & has completely revolutionized the traditional mixing techniques. Here close tolerance of rotor with the stator produces high hydraulic shearing & mechanical action that ensures that material entrapped between rotor & stator is subjected to tremendous shearing actions each minute. In-line homogenizer, emulsifying mixer, emulsifier mixer. 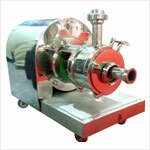 We manufacture and export a wide range of Inline Homogenizer, which is provided with precision engineered rotor/stator work head. Our range can function better than conventional mixers and help in emulsifying, homogenizing, solubilizing, suspending, dispersing and disintegrating solids. The flexibility of the In-Line Homogenizer is inherent in its design, since it may also be constructed as a rotor-rotor system, the symex In-Line Co-Twister for continuous processes. It was designed to produce an extremely even particle size distribution.